Are you overwhelmed by social media marketing? Is all the talk of clicks, tweets, and engagement making you want to scream? 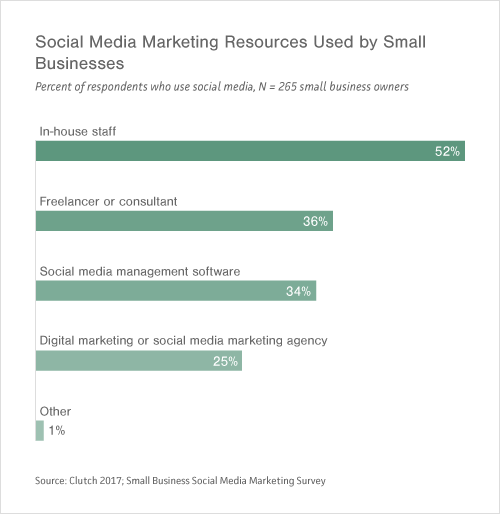 For small businesses, social media increasingly is a vital endeavor. Yet, wading through all the headlines and how-to guides can seem like an insurmountable task. Instead, Clutch is here with data-driven findings and tips to help small- to medium-sized businesses increase their social media prowess. We conducted a survey of 350 small business owners/managers across the United States to determine digital marketing habits and goals for 2017. The survey’s respondents included 40% of companies with 10 or fewer employees, 27% with 11-50 employees, 25% with 51-250 employees, and 8% with 251-500 employees. While concepts like “conversion funnels” and “geo-targeting” can help you further down the road, the following data points clarify five questions that are key to gaining a first foothold on social media. Is social media important for my business? Which social channels should I be on? How often should I share content? Which metrics should I track? What are the best resources for social media marketing help? Use the downward pointing arrows to navigate to a particular question from the list above. What’s the most basic piece of advice regarding social media marketing? It’s to actually be on social media. We found that almost one-quarter of small businesses surveyed do not yet use social media for their business, and 8% are unlikely to ever use it in the future. 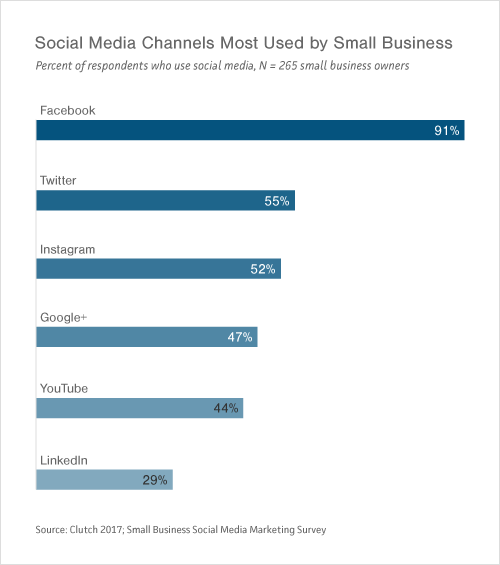 There are three key reasons why small businesses need social media: its cost effectiveness, growing popularity, and ability to target customers. First, while every business’s marketing needs differ, an active social media presence has the potential to drastically improve your marketing abilities at a much lower cost than traditional media, according to Joshua Dirks, co-founder and CEO of Project Bionic, a Seattle-based creative marketing agency. “I'm finding cost in social to be a fraction of what we'd normally see in the traditional marketing space,” Dirks said. Second, social media is quickly replacing traditional media’s presence across many channels. Gaining traction now will only help your business as marketing inevitably shifts further and further toward social. Third, social media is particularly important if your business targets social media users – as most do, to some degree. Social media provides valuable feedback about your customers, which can be used to improve the effectiveness of your marketing endeavors. Facebook is in a league of its own when it comes to social media. Over 90% of small businesses that have a social media presence use Facebook. Do you only have the time or resources for one channel? Your best option is likely Facebook. Facebook’s advertising platform is incredibly powerful. It has the ability to target customers and provide feedback on a level not touched by most other marketing tools. 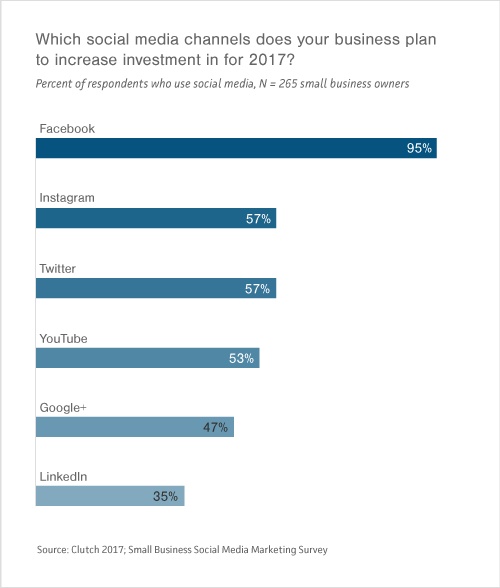 Over 50% of small businesses want to increase investment in Twitter, Instagram, and YouTube in 2017. With these investment priorities in mind – Instagram, Twitter, and YouTube – how can a small business choose, especially if they don't have time for all three? Given the uncertainty of Twitter’s future, it may not be beneficial for a small business to invest in it right now. Twitter recently shut down their micro-video sharing service, Vine and reported poor growth in 2016. “Twitter is having an identity crisis at the moment, but it's useful for brands that communicate with influencers and reporters,” said Dirks. As of December 2016, Instagram had over 600 million users and is growing rapidly. Instagram is an easy platform to dive into, given its built-in editing features and easy-to-use interface. If you have the option to expand to a second social media channel, explore Instagram. “For someone looking to reach a younger market, Instagram is a good place to be,” said Dirks. Lastly, YouTube users include up to a third of the world’s Internet users. While YouTube can reap great rewards, it’s also costly and time-intensive to craft well-made videos. If you have the time and money to invest in video, by all means, do so. For a cash- and time-strapped small business, however, it may not be worth it. Your social media channels aren’t helping your business if they remain inactive day after day. Social media is only as good as the effort you put in and the content you put out. 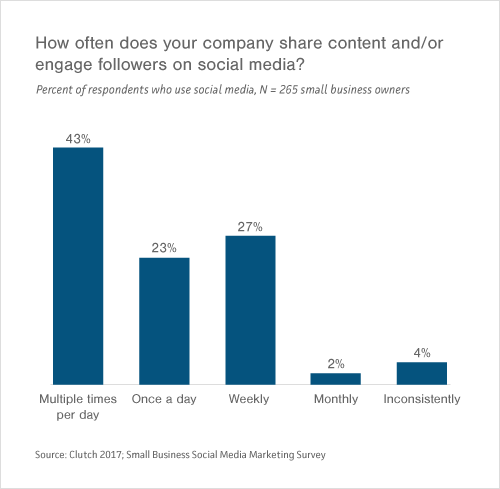 Forty-one percent (41%) of small businesses share content and/or engage followers multiple times per day, while another 23% do so once per day. However, there isn’t a single universal answer for how often you should be posting. Success differs based on the channel, your goals, and the type of content you publish. Oesterle of Blue Bear Creative recommends taking an analytical approach to sharing content on social media. “Our recommendation is to start out by testing posting frequency and gauging the effectiveness of the obtained engagement, as well as the type of response the company is getting from its followers and community,” he said. Facebook posts can have a lifespan upwards of 24-48 hours, while a tweet’s half-life can be as small as 20 minutes, said Oesterle. Understanding how content lives on its particular channel is an important step toward understanding the channels’ different potentials. You can seek out recommendations on post frequency, but ultimately, it’s best for you to test what works well for you. Start with commonly published advice – Oesterle recommends posting 1-2x per day on Facebook and several times per day on Twitter, for example, and then adjust based on results. Now that you’re investing time in social media, it’s important to measure the rewards of your work. Clicks to website and audience growth are the two most popular metrics for small businesses to measure, tying at 25% each. However, these metrics may not be the best fit for your small business, though they are a good place to start. 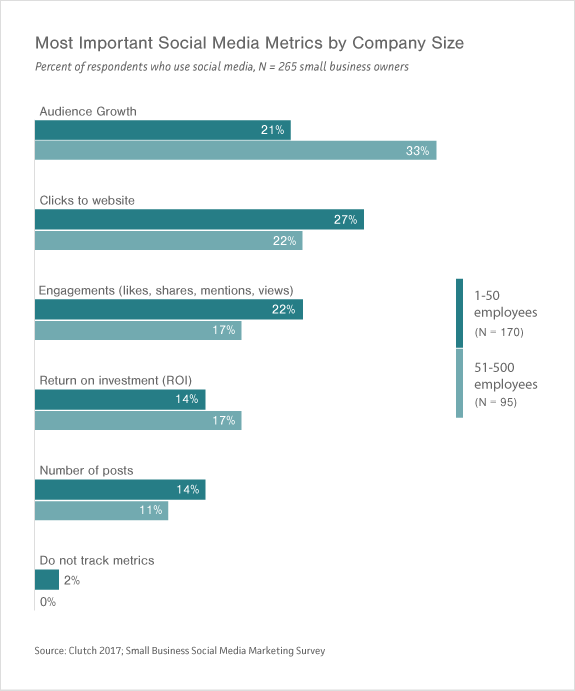 Choosing which metrics to track is similar to determining how frequently to share content. Determining the best metrics to track ultimately depends on your company’s individual goals. “I think the metric…you should be looking at is based on the objective,” said Kakadia. Interestingly, when comparing the metrics small businesses track to the number of employees they have, we found that businesses with 51-500 employees place significantly more emphasis on audience growth than businesses with 1-50 employees. Audience growth is a demanding metric. “Medium-sized businesses have a little more rope, budget, and security in being able to go through and create larger social audiences,” said Dirks about the difference. Instead, Oesterle emphasized the importance of measuring and improving metrics that lead to sales in the mid-to-long term. Still feeling overwhelmed by social media? There are numerous resources available to help you. While over 50% of small businesses keep their social media marketing in-house, a significant amount – about one-third – also use freelancers or social media marketing software to help them in their work. As businesses grow, they may come to a point where they need a team of experts to truly take their social media to the next level. This is when they should reach out to an agency. “It's important for [the small business] to be at a point where they have a clear picture of their marketing goals and what they're looking to achieve from an agency. This will make life much easier for both the company and the agency,” said Oesterle. 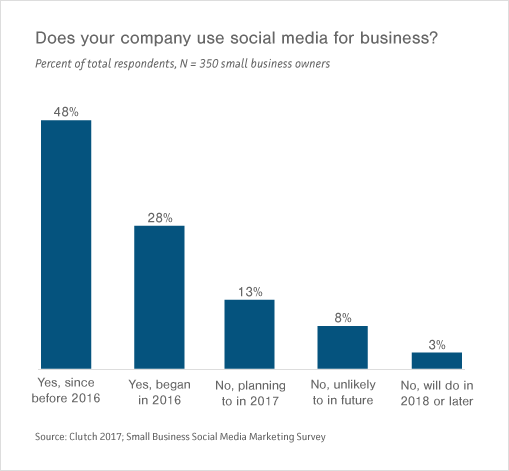 Our survey results show fairly widespread adoption of social media marketing by small businesses, but there’s still room for growth. The future is on social, and it’s important to keep the following recommendations in mind to stay ahead. Wait, you aren’t using social media yet? That needs to change. If nothing else, be on Facebook. Stay engaged on your channels. Communicating frequently is important. 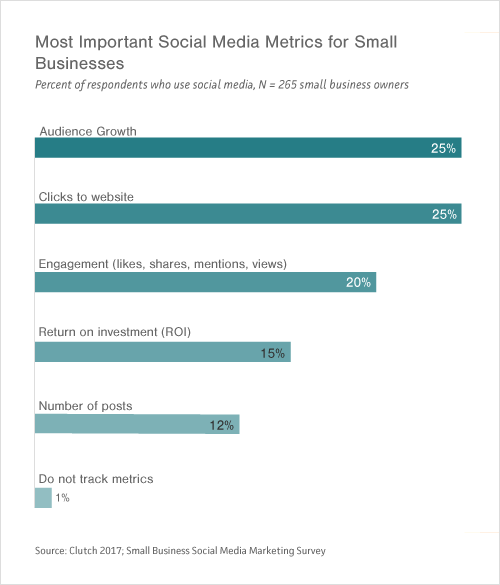 Take time to figure out which metrics best correspond to your company’s overall social media goals. Don’t be afraid to seek help, such as a freelancer or agency, when you need it. Clutch surveyed 350 small business owners and managers to evaluate trends in marketing and advertising as part of its 2017 Small Business Digital Marketing Survey. The small businesses surveyed have between 1-500 employees. 40% have fewer than 10 employees, while 46% have revenue under $1 million per year. If you have any questions or feedback regarding these results, please contact Riley Panko at [email protected]. Read detailed client reviews of social media marketing agencies to find the best fit for your business. How can social media increase your revenue? Explore social media marketing trends from around the world.